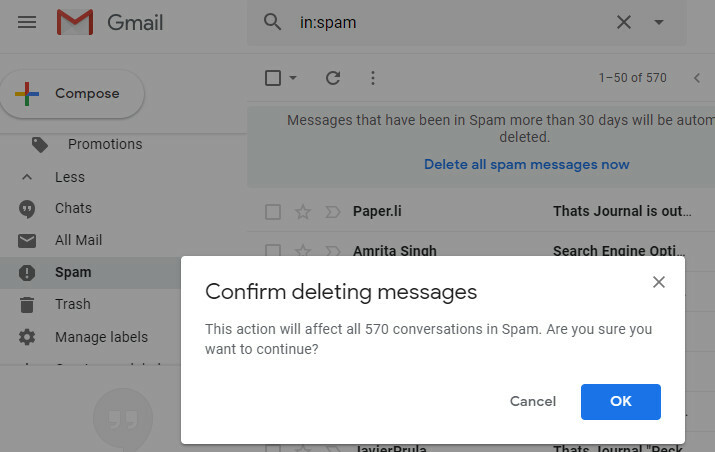 In this post I will discuss how you can delete all read, unread, starred, junk and unstarred emails from different tabs in Gmail like Primary, Social, Promotions, Updates and Forums. 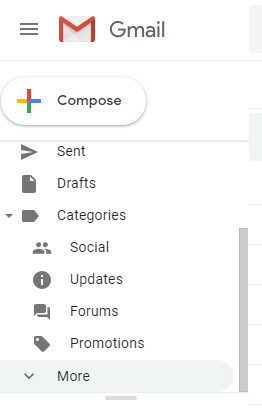 Also, you can delete emails from Snoozed, Important, Sent, Drafts, Categories, Spam and Trash Labels in Gmail. 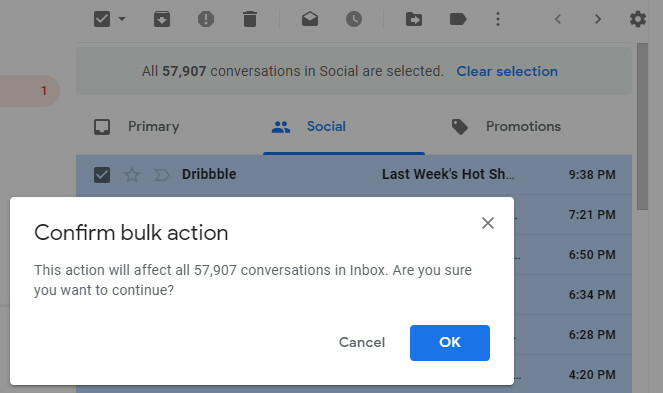 This is a beginner’s step by step guide to delete emails in bulk in Gmail. By using this method you can clean up your Gmail account and remove the unnecessary emails which are taking up the disk space. Gmail allows only to store 15 GB of data in your account. 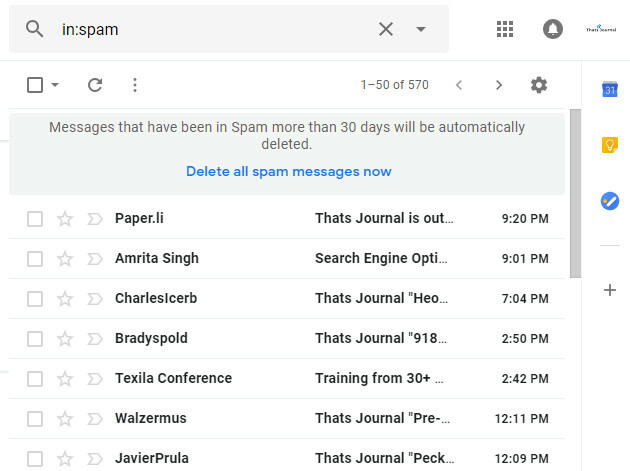 In due course of time, we got a lot of emails from Social channels and Promotional emails which clog up the Gmail account. 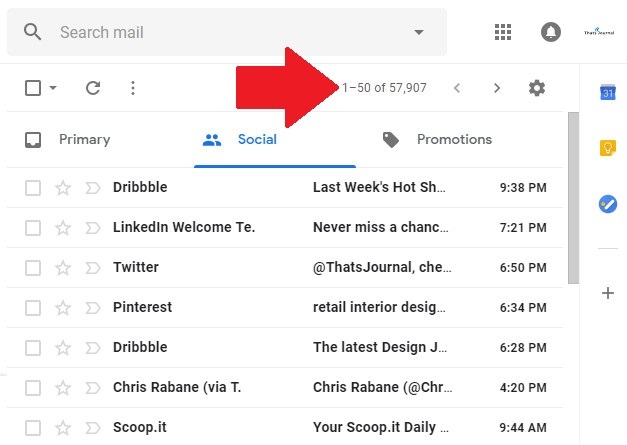 Delete emails in bulk from Gmail Tabs: To delete emails in bulk in Gmail follow the below given steps. 1) Click on the tab for which you want to delete emails in bulk. 2) Click on the drop down menu of Small square Select button just below Search mail on top. Then, click on any type of email which you want to delete like All, Read, Unread, Starred or Unstarred. For Example, here I am selecting Unread emails. Note that this selection will only delete 50 emails on this page. You can proceed with this if you wish. 3) However, I want to delete all unread emails in Social tab. For that, click on the drop down menu of Small square Select button just below Search mail on top. Then, click on All. 4) This will just select 50 emails on that page. 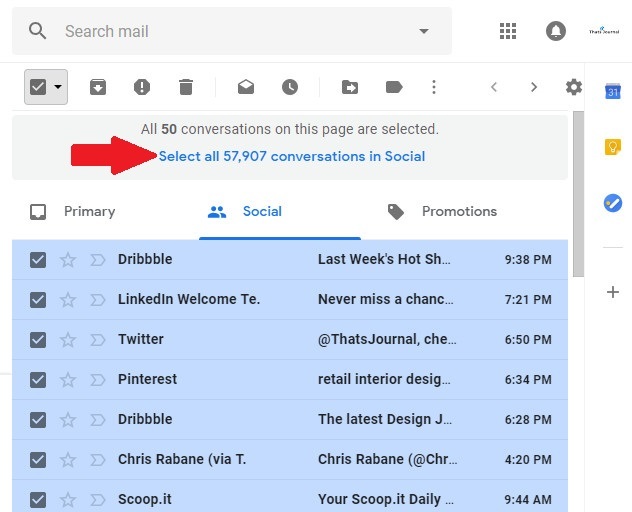 Click on “Select all 57K conversations in Social” link to Select all emails in the Social tab. 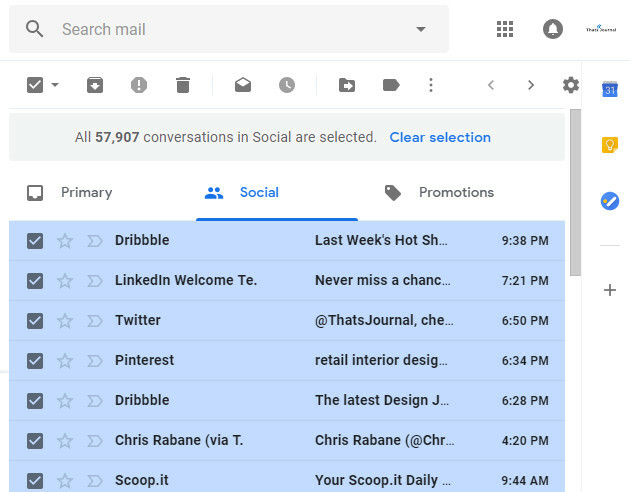 5) When you click on the link in the above step, all emails in Social tab will be selected. 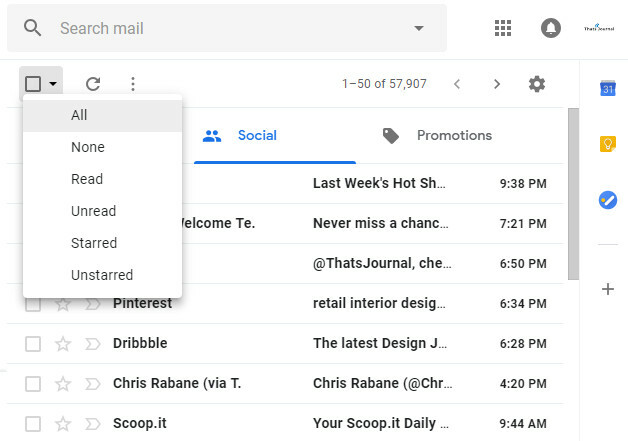 6) Now, click on the Delete button in Gmail. 7) Click on OK button on the Confirm bulk action pop up. Before you do make sure that your selections are correct. Wait for some time as all the emails are deleted from the tab. If all the emails are not deleted at once, follow the same steps till all the emails are deleted from that particular tab. Similarly click on any label like Snoozed, Important, Sent, Drafts, Categories, Spam and Trash and delete all the unread emails. 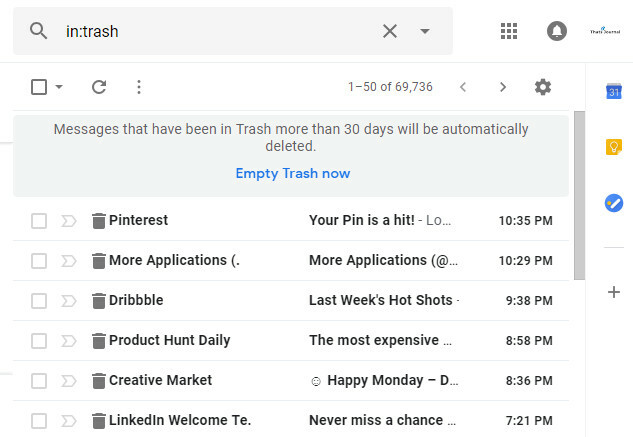 Delete Spam emails and Empty trash emails: Follow the below given steps to remove Spam and Trash emails. 1) Scroll down in Labels on the left side and click on More. 2) Click on Spam label and then click on “Delete all Spam messages now” link. 3) Click on OK button for Confirm Deleting Messages pop up. 4) Wait for some time and the Spam messages will be deleted from your account. 5) Similarly, click on Trash label on the left side and then click on Empty Trash now link to remove all the trashed emails. 6) Click on OK button for Confirm Deleting Messages pop up. Wait for some time while all the messages in your Trash folder gets deleted. 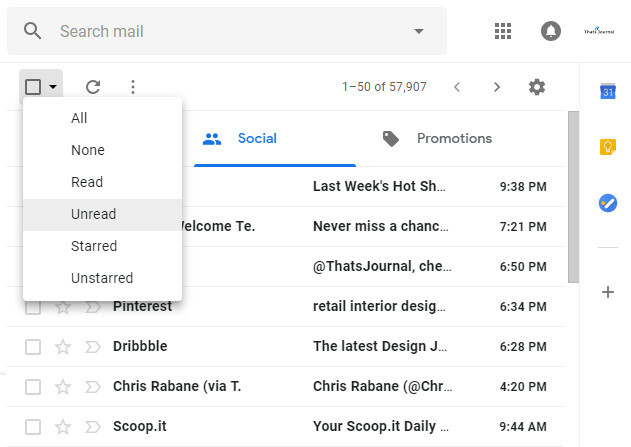 You can use the above given steps to delete all the junk emails in your Gmail account and free space. I hope this guide is helpful to clean up your Gmail account. If you have any questions or comments please let me know in comments.